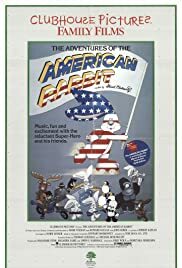 To fight evil, a young rabbit can transform into a star spangled superhero. He's here to save the day! Rodney: What's so important about this chocolate anyway? Walt: Oooh, that's such a good question, Rodney. But tell me, do you like chocolate? Rodney: Well, yeah, sure. I like an occasional munch. Walt: You and everyone else. The whole world craves chocolate. And he who controls chocolate controls *everything*! At its finest people! This movie should be used in the classroom as an educational tool about how America tries to fool us. This film was made to promote extreme patriotism. This movie is an assault on how we view other countries government systems. Yes communism isn't viewed as good in America but other countries are allowed to use their own systems as long as they don't bother us. We don't need to run the whole world! This short little cartoon actually reminds me of how McCarthy thought. Anyone who was even remotely against American politics but not America itself, was called out as a communist. I would hope that this kind of garbage wouldn't be pumped out today, especially in a kids cartoon. Shame on whoever came up with this garbage!